Everyone loves a transformation story. Rags to riches. Plain to beautiful. Weak to strong. 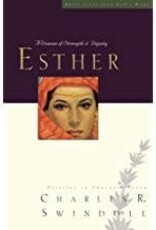 Esther's story is that, but it is much more. It is a thought-provoking study of God's invisible hand writing silently and unseen across the pages of human history. Perhaps most of all, Esther's story is the account of godly attributes like courage, dignity, wisdom, and strength?attributes that blocked an evil plot, overthrew an arrogant killer, and replaced terror with joy in thousands of Jewish homes. Author Chuck Swindoll interweaves the ancient, real-life story with insight not only into the virtues of Queen Esther, but also into how the qualities that formed and empowered her can be ours. 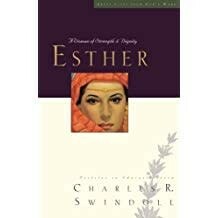 Esther is the second volume of Charles Swindoll's best-selling series, which examines great lives from God's Word and reveals the strengths and weaknesses that make God's men and women both great . . . and human. Many of the most beloved biblical heroes were ordinary folks. Shepherds. Fishermen. Servants. Widows. Even harlots and petty thieves. One by one, they changed the course of history.